Simmer sweet potatoes with a little water until very soft. Drain, and mash with butter, milk, sugar, cinnamon and curry powder. Place about 1 teaspoon of the sweet potato mixture into the center of each wonton wrapper. Brush two adjacent edges of wrapper with water, fold into a triangle, and press the edges together to seal. Brush both sides with sesame oil. 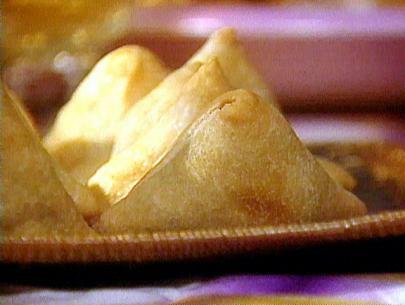 Place the samosas on a baking sheet. Bake in preheated oven for 10 minutes, then turn over, and bake for 5 minutes more.